Shorten used a speech on Friday to set Labor’s economic agenda for the next Labor government. This agenda states clearly that inequality is hurting the economy, and that anything you do to reduce inequality is good for the economy. This is not just an economic announcement. It is a social one too. And it is a huge step in the right direction for Labor. I saw this agenda coming as it’s been clear for many months that Shorten, and his Labor colleagues, have been united in their appraisal of the problem of inequality. Just to get things straight – it’s a very big moment for Australia to have our major progressive party outline how they will respond to the problem of growing inequality, and to say loudly and clearly that the answer looks nothing like neoliberal-trickle-down ‘let the market decide’ ideology. I am amongst many left-wingers who have been supporting Labor in this direction for years and so I couldn’t be happier that Labor is putting the ills of inequality at the heart of its pitch to win the next election. But, I am both unsurprised and disappointed that the mainstream political media have not only completely missed the significance of Shorten’s agenda, but have also missed the key point. Perhaps Shorten needs to make this point more forcefully, repeat it more often, or explain to the journalists exactly why the moment is so huge. Perhaps they will get there eventually. Let’s hope so. Because otherwise what hope do voters have of understanding what Labor is saying, if the journalists don’t understand it for themselves? Before I give examples of the failings of the political media’s coverage of Shorten’s announcement, I will make clear why Shorten’s inequality agenda is such a big deal. For my whole lifetime, Labor has been arguing against Liberal economic ideology using the same frame as the Liberals: that government intervention in the market is bad for economic growth, even when it is socially responsible. This neoliberal consensus, which is shared by the vast majority of political journalists, has meant that government spending, debt and deficit, taxation and ‘government intervention’ has become the villain. Conversely, reducing taxes, reducing spending, even when it hurts people, is congratulated as the economically responsible and heroic thing to do. So, with this frame as the context for all political discussions, politicians are assumed to be doing the ‘right thing by the economy’ and to be ‘good economic managers’ when they are slashing and burning. And they are ‘a hand-break on growth’ when they do anything but, such as introducing new taxes, regulations, social programs, spending on health and education, and anything else in the Labor Party stable. It therefore follows that the Liberals are assumed to be better economic managers, following the neoliberal playbook, whereas Labor are assumed to be bad economic managers, as they push back against the neoliberal playbook, whilst still accepting they have been playing within the rules of this playbook, and having everything they do reported from this perspective by the media. Therefore, the Liberals, Labor and the media have been reinforcing the neoliberal economic frame within the culture of Australian political commentary for a very long time. Finally Shorten has changed this. The significance of this moment can’t be overstated. Shorten has proclaimed that trickle-down economics is bad for the economy. This means, rather than deserving the praise of being better economic managers, the Liberals are, and always have been, hurting the economy by supporting cuts to wages, by giving tax cuts only to high income earners and leaving middle and lower income earners with less money to spend in the economy. Cuts to health care, cuts to education, cuts to any social program which increases inequality, whether that be wealth inequality generally, or gender, race, disability, access to services, regional versus cities, digital connectivity, infrastructure, access to secure employment, is bad for the economic. Pretty much every element of an Australian’s life leaves them open to having to compete on a less-even playing field because of inequality. This is because the market, the neoliberal God-like decider, is terrible at distributing wealth in an equal way. Government intervention, however, can help fix this problem. We live in a capitalist society, sure, but what Labor is saying is that big-government is not a dirty word. Government can make sure infrastructure programs are targeted to areas where employment is most needed. Government can defend wages, such as not cancelling penalty rates, and ensuring industrial laws don’t lock unions out of their representative role for workers. Government policies can ensure lower income earners have access to a comfortable and secure standard of living. Government can make sure quality education and healthcare is available to everyone, no matter their bank balance, to give every child the chance to meet their potential, rather than relying on privilege buying life outcomes, where only those who can afford to get their children ahead are entitled to climb the ladder of life-success. There are, of course, very simple ways to help the public understand the difference between Labor’s economic argument, and the Liberals’ neoliberal agenda. Take the example of a young man who does an apprenticeship and then gets a job as a carpenter. He gets work on a construction site. His income allows him to secure a mortgage to build his family a home. He can then afford to furnish that home, so he brings income to the local furniture store. The furniture store owner gets more business, and can possibly hire a retail assistant to take over her work on weekends. That retail assistant puts money in the pocket of the local car yard by buying her first car, and she eventually moves out of home. And so on and so forth. This is how consumer demand works – not by giving the furniture store owner, and the car yard conglomerate a tax cut, which takes money out of the economy, but by growing demand in the economy through people having money to spend. Then they have money to spend and save, they can make plans in their lives, they can build homes, and be confident to live a little, to go out to cafes and restaurants, and use annual leave to go on holidays. They only feel confident to do this when they have secure, stable employment, and their effort at work is compensated with wages reflecting their contribution to the success of the business. This compact is the story Labor is now telling. It’s important to note that the carpenter needed the apprenticeship in order to kick-start this equation, and yet the Liberals have been gutting vocational education and TAFE. Repeat this breaking of the compact throughout the Liberal’s terms in government and it’s obvious why Liberal ideology is so bad for the economy and why Labor now needs to mend much of what they have broken. So, how have journalists misunderstood this story? 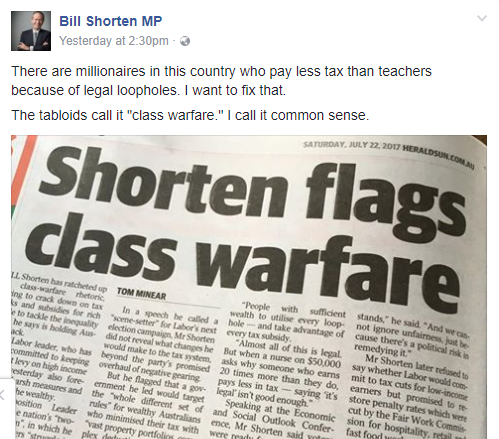 Predictably, News Ltd got it most wrong with the Herald Sun’s Tom Minear writing ‘Shorten has ratcheted up class-warfare rhetoric’. So it’s all spin and it’s pitting the rich against the poor? This is on a different planet level of wrong-wrong-wrong. Barrie Cassidy, in his interview with Shorten on Insiders, wasn’t far from calling the equality agenda shallow-election-spin. Or worse, ripping-off populist strategy from Corbyn and Sanders. Eye-roll. Mark Kenny’s SMH analysis wasn’t quite as narrow, but he still fell into the old frame of describing the Labor ‘heart’ battle versus the Liberal ‘head’ message, which means Labor is addressing inequality not because it’s hard-headed and good for the economy (because Liberals own that ground), but because they have a heart – they want to be nice to people. This is wrong, and Labor should correct the record on such an obvious misunderstanding of their policy platform. The closest I’ve seen a writer get to showing they see the significance, and understand the economic thinking behind the story, is The Guardian’s Greg Jericho, who wrote: ‘The economic debate for too long was based in the old canard that there is a trade off between growth and equality’. As I’ve written recently, the old neoliberal frame which the ‘establishment’ have been using for decades – politicians and journalists alike – is that there is a choice between economic growth and social spending. No. There is not a choice. Or, as Jericho calls it, a trade-off between growth and equality. In fact it’s simpler than that. You can’t have growth without tackling inequality. This is where the heart of Labor’s story lies, and why Labor deserves congratulations not just for doing what is kind, or right, or caring, or fair. But for also doing what is economically responsible – what is best for the economy AND the people who make up that economy. I guess Shorten just needs to keep saying it until they all catch up. These so called journalists do not misunderstand. It is deliberate on their behalf to misrepresent and misreport anything Labor do. All these so called journalists are “owned”. They have not got the balls, the courage to be positive to Labor. They are told what to write and like the pathetic and gutless cowards that they are, they do what they are told. I put these so called journalists in the same basket as the despicable mongrels of the lnp. They are reason we ended up with Abbott and the grub Turnbull. The media should be called out for the low life grubs they are. Dear Queen Vic, We miss your words! Are you alright?